"WHITEHAWK" represents one of Bruce King's finest designs, inspired by L. Francis Herreshoff's famous "Ticonderoga." A successful charter yacht in the past, her most recent private ownerships have lovingly maintained her and completed many refit items. "Whitehawk" represents a unique opportunity to own a timeless slice of American yachting at it's best. Cold molded wood hull construction results in an exceedingly strong and resilient hull structure capable of world cruising in comfort and safety. Designed by Bruce King for upwind performance with her centerboard down (16') as well as shallow draft with her board up (7'6"). This allows access to shallow cruising areas while also providing exceptional offshore capabilities. 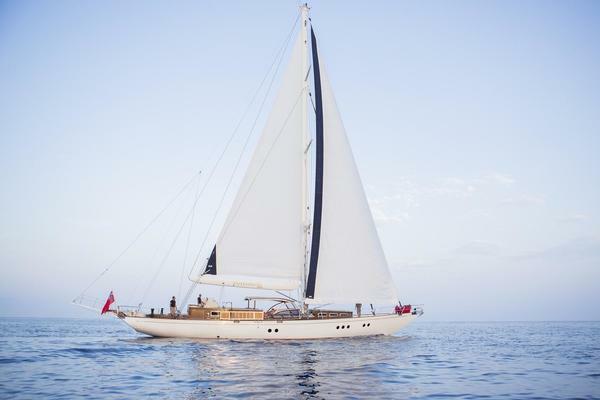 This beautiful classic sailing ketch is offered in superb condition and ready for the next adventure. life lines. High white bulwarks are decorated with 2 bronze dolphins and bowsprit.